Prior to starting this blog, I did very little garden-related reading. In fact, most of the garden reading I had done was the technical kind, usually to research a plant or a seed. It never crossed my mind to want to read a gardening book for pleasure – and now I find myself craving garden books and garden blogs. Recently, I read two remarkable books at the same time, and I am enchanted. From the moment I received One Writer’s Garden, by Susan Haltom and Jane Roy Brown, from my friend Catherine, I knew it would be a difficult book to categorize. It’s definitely a gardening book, but it’s a biography and a history book, as well – all woven together with strands of roses and irises and camellias. The garden, located in Jackson, Mississippi, was designed and planted by Chestina Welty, an amazing woman who passed her love of gardening on to her daughter, the Pulitzer Prize-winning Eudora Welty. In beautifully written narrative, the reader is transported to a time that now seems almost other-worldly. Throughout the glossy pages, like a true companion planting, are sidebars to further enhance the story, from a description of proper gardening clothes to photos of the garden from the Welty family. To further compliment the words are recent photos of the garden, taken by Langdon Clay. 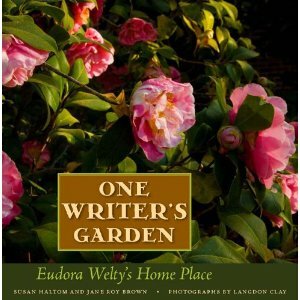 Most striking is the role that family and southern culture and gardening played in shaping Eudora Welty’s written words. Thanks to her published work, as well as a tremendous amount of personal letters and journal entries, the reader is given a beautiful picture of Welty’s world, her talent, and her passion for family and roots. In Welty’s later years, the garden fell into neglect, and the final chapter is dedicated to the efforts of a group of gardeners, among them the book’s author, Susan Haltom, who restored it to its original beauty, using many of the same plants that Chestina had planted in 1925. While one book is completely Southern in nature, the next offering is pure New England. 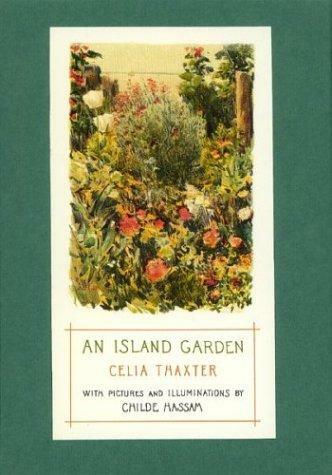 An Island Garden, by Celia Thaxter, is, simply put, a love story between a woman and her garden. Her words are a beautiful testament to passionate gardening, and it is peppered with wit and charm and observation and humor (especially the ferry ride from mainland New Hampshire to her island cottage). If I had to have one criticism, I would have to choose my purchasing An Island Garden on Kindle, which deprived me of Childe Hassam’s illustrations and illuminations. This is definitely not an e-reader book – although it can be enjoyed electronically (illustrations and illuminations and all) thanks to a digital copy at the University of Pennsylvania — a midwinter’s gift to you. Everyone is commenting that this winter has been strange. One day, it’s winter — and the next is spring — and autumn is just around the corner. That’s why these books are so important to read. They’re balanced. They’re restorative. They make sense. And they make you wonder, if the technology had been available to them, how these two women could have further enriched the blogging world with their prose. Both books are not only enjoyable reads, they’re also beautiful in appearance. Enjoy! These sound great….I always find it fascinating the role that personal Garden history combined wih the culture of that time, play in the ways people garden and the plants they choose. I was given “Women of The Harvest” by Holly L Bollinger and Cathy Phillips, which is about contemporary women farmers in USA. Its a lovely and interesting book . And I just love reading “Ellis Rowan, a Flower-Hunter in Queensland” about a very unconservative and some would say, eccentric woman whose passion for painting native flowers became an adventurous and profitable career. She lived from 1848 til 1922. Thanks for the info. Between writing, gardening, and reading, it’s clear that work is an inconvenience — a necessary one, but an inconvenience. If only we had more time. Enjoy the day. Thank You for the wonderful gift! Only snow grows here in Finland right now, but your gift will make dreaming of spring more fun. Love your blog! Thank you for commenting and for your kind words. Glad I could provide some material for spring dreams. Stay warm! I, too, love reading garden books and these both sound fabulous. It’s funny how this hobby can turn into an obsession that influences all areas of our life. It’s something that I never expected. I don’t think I’m ready for an intervention, but “obsession” doesn’t seem like a strong enough word. Happy reading! I’m glad you enjoyed them, and I hope you can get the chance to look through them — especially An Island Garden. Kevin I have put it on my list of “To read”. Ditto find myself reading round the subject – have had to sack myself from 2 bookclubs who just do not get the point about “A short guide to Rock Gardening” and the like. 🙂 Perhaps you can start a gardening book club? I presume they are books available primarily in The States, Kevin. I must have a look. i particularly like the sound of “One Writer’s Garden”. I haven’t quite got into Kindle yet although i can see it’s benefits and i did give one to P for his birthday. But certain books won’t really translate including many gardening books. Sorry i haven’t been to your site lately Kevin, i just find there are too many gardening blogs out there and I can’t keep up. Thanks for visiting Planticru Notes. The books are probably in the States, but An Island Garden can be read by anyone thanks to the University of Pennsylvania. Just click the link. I know what you mean about the number of garden blogs — but when you do have time, you’re more than welcome to stop by. Cheers! Now, where do I hand in my application for extending the day from 24 hours to…shall we say 30 hours? Don’t want to be too greedy, I am sure I could fill 35 hours a day, but a 30 hours day would suit me fine for now. Just think about all the things I could get done in the garden, in the house and on my computer….!! I, for one, would love a three-day weekend. For starters, the workday seems to end later and later already — and two days just isn’t enough time to take care of inside, outside, and life. Only in our dreams, I guess. Take care. Kevin, you are amazing. You take the personal gift of a book and then begift the cyberworld with it! It was definitely a book worth sharing. Thank you for thinking of me. I have a bad habit of buying garden books. Just yesterday I ordered one recommended by another blogger. I have no more room for them! The bookshelves have overflowed to tabletops and even the floor. And now you tempt me with more great books. Yup. I know that when it comes to books, many of us cannot stop ourselves. It’s the words, the photos, the ideas, the escape — it’s amazing what can be found between the covers. Happy reading! I will definitely add it to the reading list. Thanks for the tip. I am going to put An Island Garden in my library queue right now! Thanks for the recommendation- I love reading any kind of garden or food memoir. I’m glad you found my blog and a new book. It’s truly a treasure. Happy reading! I am from Mississippi and didn’t know about the Eudora Welty book! I am planning a trip to see the garden this spring. Thanks for the review! From the images in the book, it looks like a beautiful place. Take plenty of pictures!